Doers are the backbone of every successful endeavor, those self-directed achievers who do the right things the right way for the right reasons. The survivability of a competitive enterprise hinges upon its ability to make the highest and best use of their desire to get things done. Doers hold the key to sustainable success in today’s complex workplace. They can do amazing things when provided with right resources and the authority to act. Typically few in number, these gifted producers support and promote the organization’s intended purpose. Doers are the “go to” people you count on when others let you down. They supply the energy behind better outcomes. Doers are the driving force for creativity and continuous improvement. Deployed strategically, they can halt decline and restore prosperity. Doers occupy key positions at all levels from the boardroom to the break room, but their efforts are not always appreciated and their achievements are too often overlooked. Unfortunately, Doers can become so focused on innovation that they are blindsided by hostility from resistive coworkers and resentful bosses who see them as a threat. 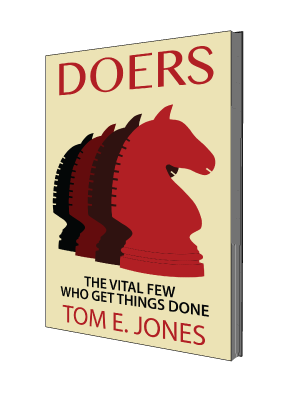 Doers: The Vital Few Who Get Things Done addresses the many challenges facing high performers and the organizations that employ them. This revealing new book provides practical advice and easy to implement solutions written in a common sense voice. Regardless of where you work or what you do, if you are truly interested in doing a better job, you will benefit from what this book has to offer.